Going North on US-89, take the first left as you enter the town of Dupuyer (Dupuyer Creek Road). Continue for eight miles until you reach a fork in the road. Take a left and travel less than a mile until you see the TRM Ranch/RWCC sign with an arrow and turn right. After you pass the TRM Ranch main entrance, stay left and drive past the upper ranch house and continue on to the Center. View from deck at the Rasmuson Wildlife Conservation Center. 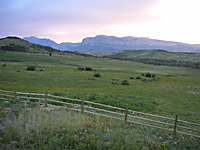 The 5,500 square foot Center houses the education, research, and demonstration programs that take place on the livestock ranch west of Dupuyer, Montana. High School students learn about monitoring wildlife with radio transmitters during an overnight outdoor classroom experience at the Lee and Penny Anderson Wildlife Conservation Program on the TRMR. This lesson was assisted by the University of Montana, Boone and Crocket Club graduate students and the Lee and Penny Anderson Conservation Education Program. 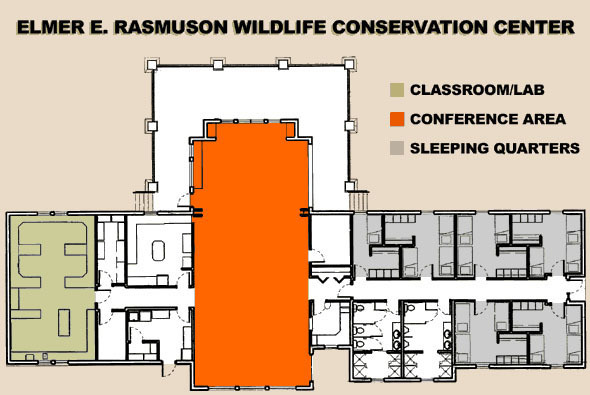 The Center can sleep up to 30 guests (in five bedrooms) and two staff in a separate bedroom, feed 60 people from the commercial kitchen, and seat 60 to 104 in the main conference room. The lab/classroom is setup for 30 students to work on field related activities. The remaining square footage includes an office, public restrooms with shower facilities, utility room with a pantry closet, washer and dryer, a lab/classroom with storage area, dining area, and an outdoor deck surrounding the west end of the conference room perimeter. The building was constructed to blend into the surrounding landscape and have a high energy efficient rating due to the high winds and inclement winter weather. The Center takes advantage of the surrounding vistas and prevailing strong winds. The building is used year round by students, teachers, and others. The addition of the Center at the TRM Ranch serves as a hub for the Boone and Crockett Club's Conservation Education Program. It provides an effective facility for courses, workshops, presentations, and demonstrations about integrated natural resource management, natural resources education, and special topic seminars. The competing needs of wildlife and commercial land use is one of the nation's most pressing and controversial conservation problems. Conservationists  with good reason  press for the preservation of threatened species and respect for our great national wildlife heritage. Ranchers, farmers, miners, foresters, oilmen, and developers  with equal reason and right  seek protection of their commercial activities. Too frequently, wildlife conservation and economic survival conflict. As wildlife habitat shrinks due to increasing and conflicting land uses, we must find ways to make wildlife, agriculture and other commercial development needs more compatible. The Center is also available for a limited number of days each year to outside groups. Click here for more information or to request a brochure about the facilities and programs offered by the Boone and Crockett Club.